Most people have soup in winter, fresh fruit and ice creams in summer, etc. I confess — I’m often a few seasons behind (or maybe ahead? :) ). And so while everyone is busy making ice creams, pops, and other summer goodies, of course I get a craving for something warm, baked, and cozy… go figure! I blame the maple pie baking sesh I had right before for for awakening the autumnal cravings. And so cookies happened. 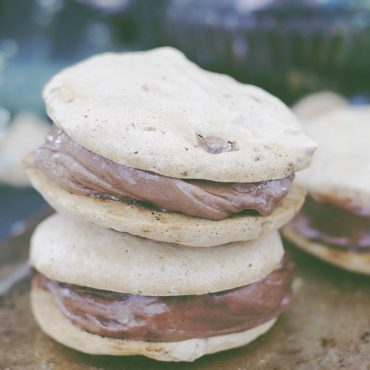 These cookies go great with a nice cup of coffee or tea. My friend said that they are like the perfect soft biscotti — at which we laughed because soft biscotti is not a thing. But truthfully that’s strangely a good way to describe these. 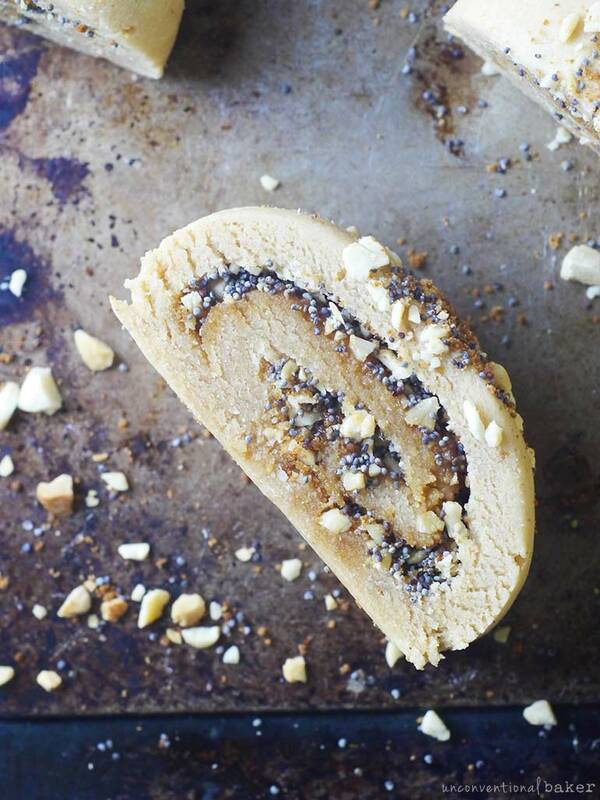 They’re sweet, nutty, soft, and go down well with a cozy drink. 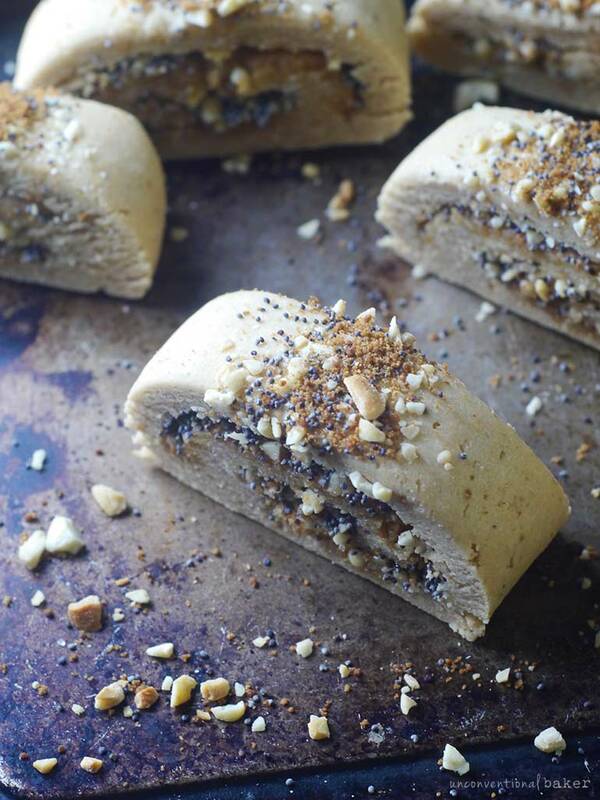 Last but not least, just wanted to give a little nod to the pretty and festive speckles in these cookies: poppy seeds! I’ve come to realize I seem to neglect them way more than they deserve. But they’re really the star of the show here in many ways, and they just make the cookies seem irresistible somehow :) I look forward to sharing something ultra poppy seed-based soon to give these little guys a proper highlight. 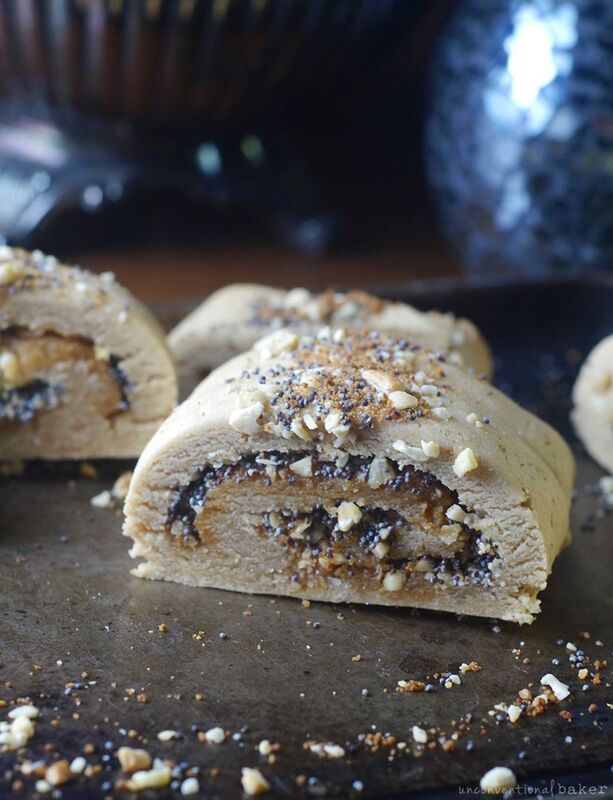 A delicious soft cookie roll filled with crunchy pieces of cashews and poppy seeds. 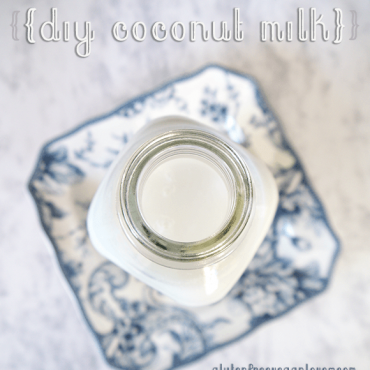 This recipe is gluten-free, vegan, refined sugar-free, and made with no added oils. Process all cookie dough ingredients in a food processor until the mixture begins to form a ball (note: if the mixture is too runny, add a bit more flour, if too dry, add a bit more maple syrup). Form the mixture into a ball with your hands and knead briefly, then flatten into a rectangular shape with your hands. 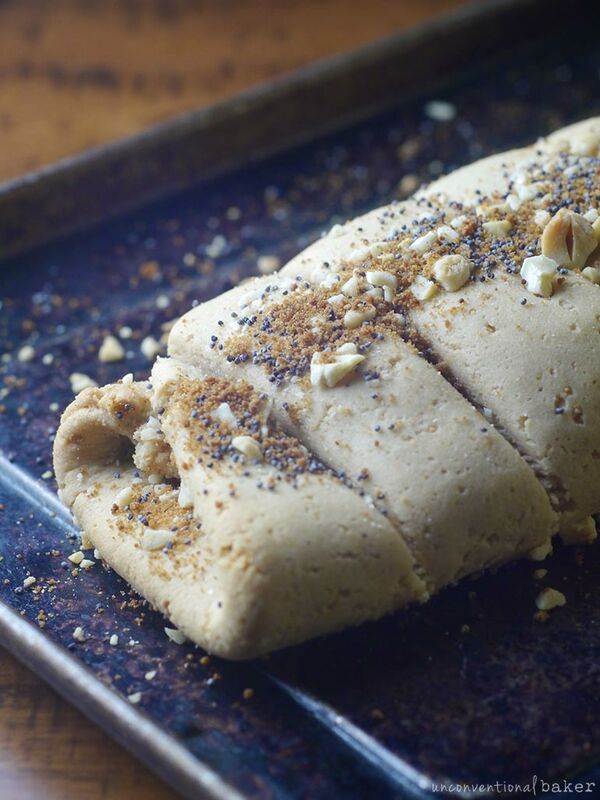 Roll the dough out with a rolling pin between two sheets of parchment until it’s about a ¼” thick. Sprinkle the filling ingredients over the rolled out dough. 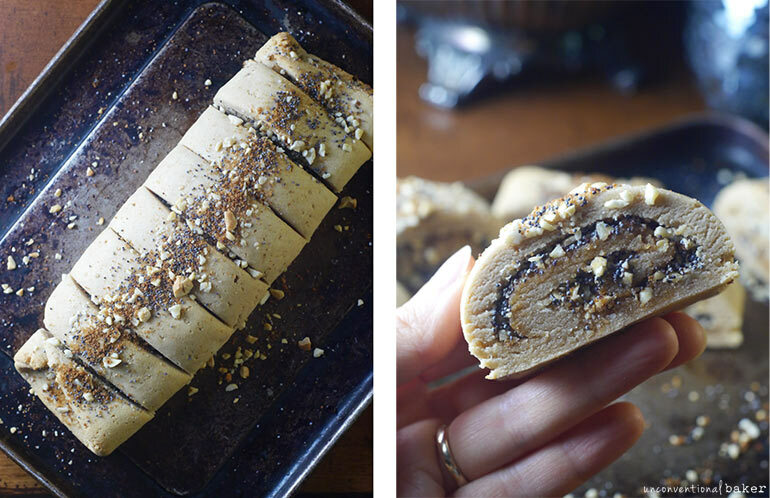 Then carefully roll the dough into a tight log (lift the edge of the parchment paper underneath on the side from which you are rolling to help the log roll up more easily and evenly). 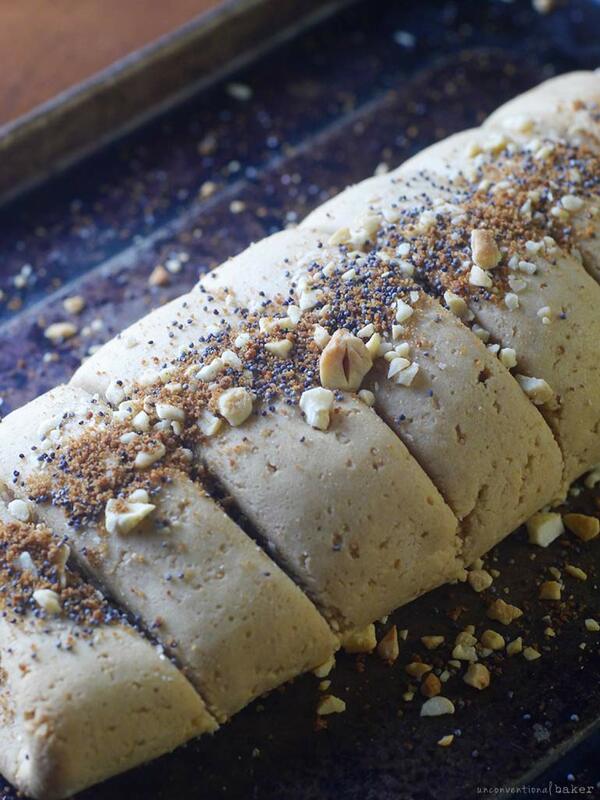 Once rolled, sprinkle the top of the roll with the toppings and press them into the log lightly. Cut the log into slices (approximately 1″ thick). Transfer the parchment that the log is on onto a small baking sheet. Bake in a pre-heated oven for 20 mins. Then cool on a rack for 10 mins and enjoy! Storage note: once the cookies are completely cooled off, store them in a sealed glass container at room temperature. 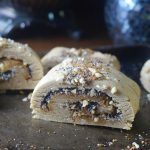 Disclaimer: this recipe contains affiliate links to white rice flour, cashew butter, maple syrup, pure vanilla extract, salt, cashews, coconut sugar, poppy seeds, and a food processor. Hi Audrey, do you think I could use spelt flour or oat flour in place of the rice flour here?